Facebook just announced that it has signed-up a year-long deal with McAfee to offer free download of its security software. That’s putting McAfee’s software available for download to 350 million people, although not all of them might be PC users. The deal would allow Facebook members to download and use the security software for a free six-month subscription after which those who opt to continue using it can renew the subscription at a discounted cost. Again, thanks to Facebook’s deal. And the reason why Facebook is doing this? To help its members protect themselves against security threats that could otherwise hamper them from using their computers which might include accessing Facebook. It’s a nobel effort from Facebook. Although we could not discount the fact that it’s also a marketing ploy for McAfee and Facebook. Either way, there’s no harm in getting the free security software even if you can use it only for six months. And in case you’re computer is already compromised even before you got the McAfee software, Facebook will detect it once you try accessing its site. It will then ask you to go through several processes which include running the McAfee virus scan procedure. Again, another one-of-a-kind service from the world’s no.1 social networking site. 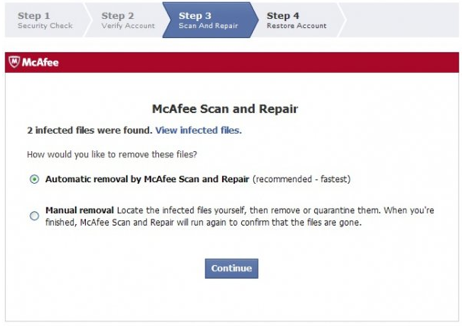 To get the free McAfee security software, simply head over to the Protect Your PC tab on the McAfee Page on Facebook.